Cydcor has a distinctive corporate culture. That culture is built around actively living the Behaviors We Value. These values dictate everything we do, from our daily interactions with clients to volunteering with and supporting local charities. Living and breathing the Behaviors We Value credo is what separates us from our competition and consistently gets Cydcor ranked as one of the best places to work. At Cydcor, our corporate culture encourages others to give back to their communities. The sales teams support numerous charities and events. Our Neighborhood Leader Program provides Cydcor’s network of independent sales offices resources to donate to their local communities through charity and volunteer work. Being a good ambassador in your community takes time. That's why Cydcor provides an annual benefit that allows each employee to spend time volunteering for a nonprofit organization or cause they care about. What is important to our team members is important to Cydcor. Since 2010, Cydcor, along with nearly 4,000 dedicated volunteers from our network of independent sales offices, has been partnering with Operation Smile to provide children from the developing world with free, life-changing cleft lip and cleft palate surgeries. To date, we have raised more than $800,000, through our annual fundraising events and we have funded six medical missions around the globe. 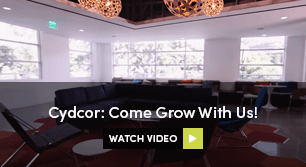 Cydcor: Come Grow With Us!